The table is set. We’re still uncertain how many people will celebrate Thanksgiving with us. I remember Eloise (she’s the woman who posted DNR’s all around her home, and died in her sleep at 95) telling me, “when planning a party and older people are coming, there’s a chance someone won’t make it.” We now know the college grad is coming. Still not certain about our recently-out-of-the-hospital relative (in his 70’s) and his wife. That said, we decided it’s easier to subtract than to add places at a table. We put leaves in at either end and will sit two people on each end. If our relative and his wife can’t come, one person will sit on each end–not a difficult change. And we will be thankful that we’re together once again. And again this year we will give thanks for our many blessings and ask protection for those in far away lands, sacrificing to keep us safe so our lives and traditions can go on as usual. 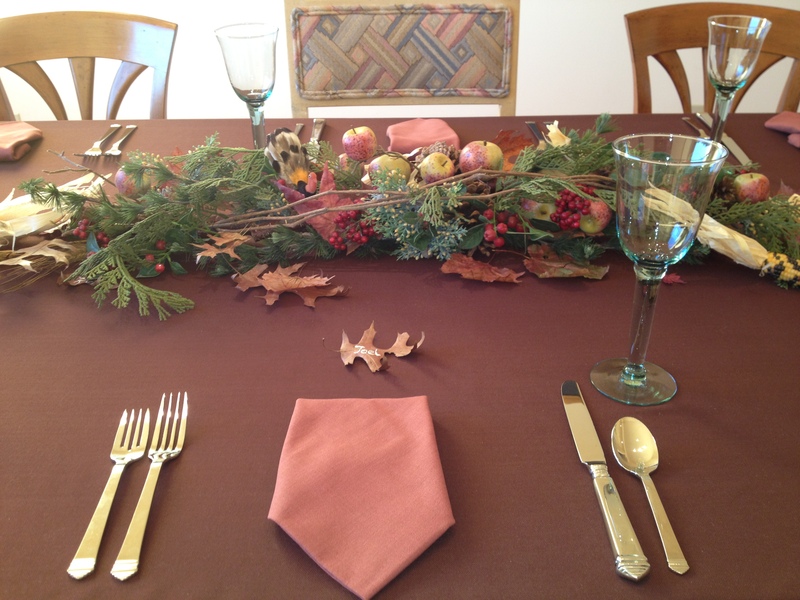 This entry was posted in Aging parents, Thanksgiving and tagged aging, older people with health issues, Thanksgiving table setting, Thanksgiving traditions. Bookmark the permalink.